Nothing beats a delicious, warm egg-in-a-hole with toast on a rainy morning. 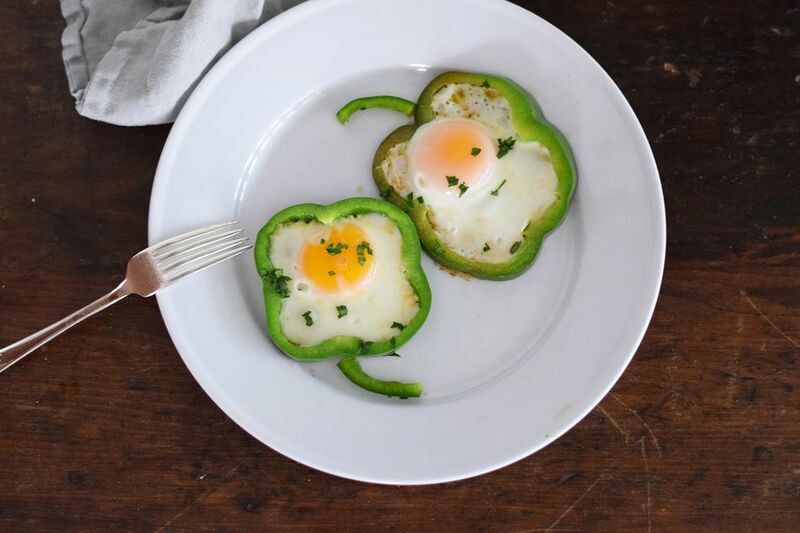 Add the adorable bell pepper rings and you've got a satisfying and cute St. Patrick's Day breakfast that is sure to please both the Irish and Irish-at-heart. Make sure to pick a green pepper that looks like it has four distinct chambers when you look at the bottom. Otherwise, it will not look like a four leaf clover as some bell peppers only have three chambers. You can serve these egg-in-a-holes along side sausage, bacon, or any other Irish breakfast staples. Make sure to serve with some toasted bread for dipping in the egg yolk. Or skip the bread and enjoy a low-carb breakfast! Feel free to add other seasonings to the eggs or switch up the parsley for chives or other herbs. If you want to make the eggs greener, separate the yolks from the whites and dye the whites green with green food coloring. Then place 1/4 of the dyed whites into each ring and top with one yolk each. Then complete the cooking process as normal. Heat a large cast iron skillet or non-stick pan on medium-high heat. It is realistic to cook two egg in a holes at a time, although if you have a large enough pan you may be able to fit four. Thoroughly grease the pan with butter or non-stick cooking spray. Place two rings of bell pepper onto the pan. Make sure when you are cutting the rings that the rings are level, otherwise the egg will seep out of the sides. You can test this out on a plate first, just look for gaps along the edge where the plate meets the bell pepper. Crack one egg into the center of each bell pepper ring. Sprinkle with salt and pepper and then cover the entire pan with a lid. Turn the heat down to low and allow them to cook for 3 to 5 minutes, or until the egg white has cooked completely and the egg yolk has set slightly. Remove the pan from the heat and carefully remove the egg-in-a-holes using a thin, yet firm, spatula. Place the egg rings on a plate and top with chopped parsley. Cut a few smaller (1-inch) pieces to place as the stems of the four leaf clovers. They can also be kept warm in a 200 F oven while you make the remaining two eggs. Serve with buttered toast cut into sticks for dipping in the egg yolk.